Mabil’s first-half strike – his fourth in seven international appearances – gave Australia the lead before Kharbin equalised two minutes later. Ikonomidis’ first competitive goal for his country early in the second half had Syrian players pleading with Mexican referee Cesar Ramos that the ball hadn’t crossed the line. Syria and their boisterous fans were again up in arms minutes later when Socceroos’ captain Mark Milligan appeared to handle inside the box but Ramos turned down their penalty appeals. Syria did get a penalty in the 80th minute however when Al-Soma appeared to trip over a teammate inside Australia’s box. The striker – who scored both his country’s goals in a World Cup playoff between the two nations in 2017 – promptly swept home the spot kick. But in the end it was Rogic’s right foot which ended their tournament. 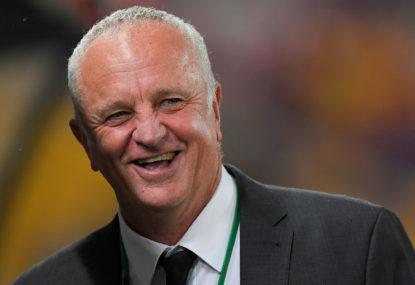 “I just thought it was a helter-skelter game at times because Syria played very direct and very long,” coach Graham Arnold said. “It’s all about the second ball, and it’s all about the challenges, and it’s all about playing against the way we want to play because the ball’s in the air all the time and we want it on the ground. Syria go home without a win while Palestine’s 0-0 with group winners Jordan mean they’re still a chance to progress as one of the four best third-placed teams despite not scoring a goal so far in the tournament. Australia’s next match will be on Monday, January 21 giving Arnold’s injury-hit squad valuable time to recover whoever they play. “We’ve got five days between now and the next game and I expect probably three of those players back out of the four,” Arnold said. “I know (Japanese coach Hajime) Moriyasu very well. I played with him at Sanfrecce and I know he’s a winner.